The Halls of Ivy was a radio situation comedy that ran from 1949 to 1952 on NBC. The series featured the British actor Ronald Colman as William Todhunter Hall, the president of a small, Midwestern Ivy College. 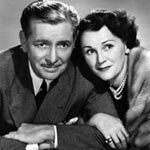 Colman's wife Benita Hume, played Mrs. Hall, Vicky, who was also a former British musical comedy actress. Herbert Butterfield played the testy board chairman Clarence Wellman; Willard Waterman was a board member John Merriweather. Elizabeth Patterson and Gloria Gordon played the Halls' maids. The show was created and written by Don Quinn, who famously wrote the scripts for Fibber McGee and Molly. The plots of the Halls of Ivy deal with the campus life, presenting school personnel's interactions with students, friends, and college trustees. Once in a while, the listeners also get to join Professor Hall's reminiscing about his younger days with Vicky in London. The presentation of the Halls' home life greatly adds to the show's wholesomeness and jocularity, too. The show is a enjoyable, sincere, yet lighthearted, depiction of the Halls' home and professional lives.